A Baroque style Benedictine church along the Via Dei Crociferi, San Benedetto is one of the most important churches in Catania. Built in the early 18th century, it is a prestigious monumental complex and considered as one of the most beautiful Baroque churches in Europe. The church was frescoed in a time period of three years by a painter named Giovanni Tuccari who was known as lightening of painting because of his rapidity. The altar, the cantoria and the monumental staircase of the angels are striking. A popular legend suggests that the church of the Benedictines is connected to the Benedictine monastery of San Nicolo by a secret underground passage supposedly used by the monks for forbidden love visits at night. Twist in the tale, isn’t it! Ticket price includes audio guide. On Sundays, the entry is after the mass. How popular is San Benedetto? People normally club together Basilica Della Collegiata and Palazzo Degli Elefanti while planning their visit to San Benedetto. We enjoyed a superb tour of the church and the accessible areas of the convent with an audio guide. 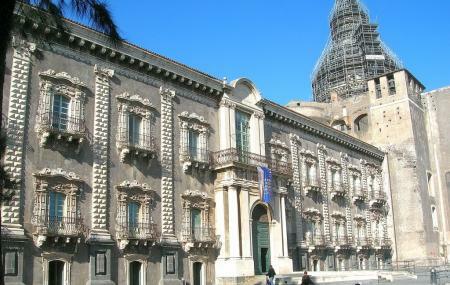 A beautiful example of Sicilian Baroque. If only people would respect them more.